Thousands of women rallied near Tahrir Square in downtown Cairo on Tuesday, protesting the mistreatment meted out to women protesters by security forces. In some instances, the police had pulled up the woman’s dress and stomped on her. 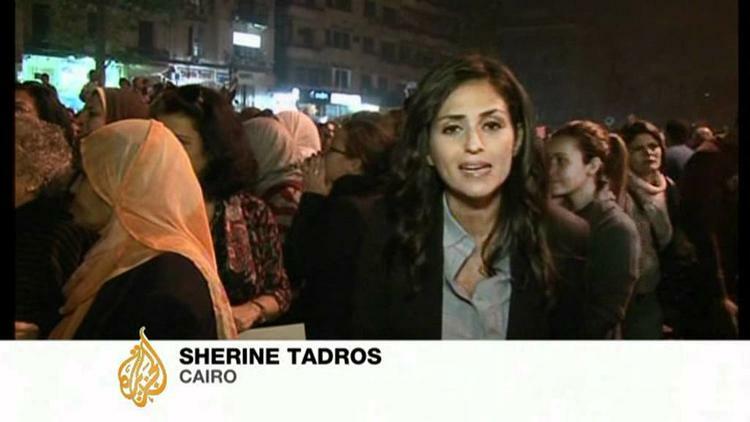 Indeed, women rallied all over Egypt, according to the Arabic press. A march was held in Alexandria in solidarity with with the young women who were attacked by police in Tahrir Square and insisting that women have the right to demonstrate. Likewise, students held a rally at Asyut to protest the bad treatment of demonstrators in front of the cabinet on Saturday. Tuesday began with an early morning raid on Tahrir Square by aggressive security police trying to push the demonstrators out permanently. The Egyptian protesters consist of two main groups, 1) leftist students and their worker allies, and 2) the Muslim religious parties. The latter are doing well in parliamentary elections. The military council is cracking down hard on the left, and the more electorally successful Brotherhood is not standing up for them.